On Friday 7th of march 2012, SLÄNDA was launched on an internet wave that has resulted in a world wide spread in just a few days. 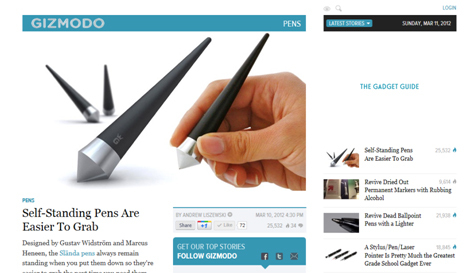 One of the world's biggest and coolest gadget blogs Gizmodo.com - has published a top story about Slända- Self standing pen are easier to grab. It has over 37 000 hits in less than 4 days. This is fantastic! And it has created a shock wave over internet. Blogs and opinions leaders all over the world are now picking up the Story. We love it! We have had more than 10 000 unique visitors on our web page during these few days. SLÄNDA has taken another big step out in the world!